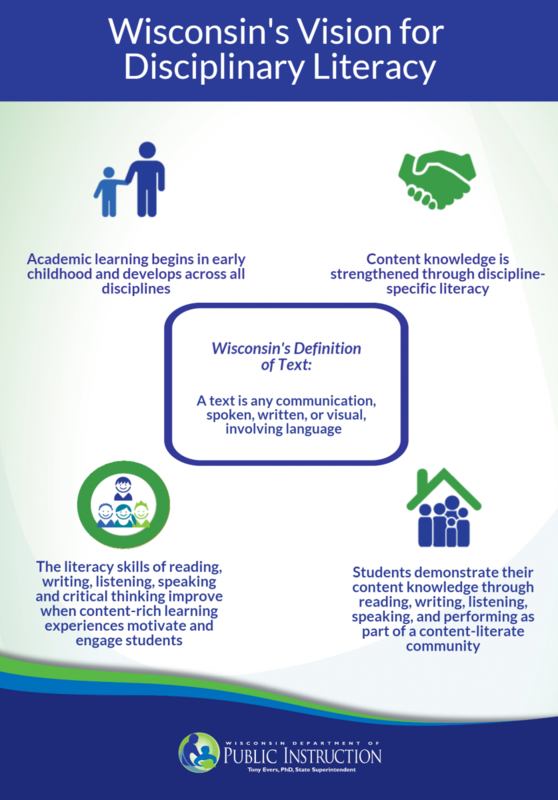 In Wisconsin, disciplinary literacy is defined as the confluence of content knowledge, experiences, and skills merged with the ability to read, write, listen, speak, think critically and perform in a way that is meaningful within the context of a given field. For more information on the standards, please review the document on Literacy in all Subjects or the DPI Literacy in all Subjects webpage. Scientists and other STEM professionals have unique ways of accessing and communicating information. Students generally do not gain those skills in an English course. They benefit from explicit instruction by someone who understands scientific practices in order to link language skills to this complex content. For example, having students read a text and identify main points and key vocabulary is not disciplinary literacy; disciplinary literacy in science focuses on the unique ways that scientists interact with texts. During 2015, a group of science and literacy educators from across Wisconsin came together to curate and create teacher resources to support work with disciplinary literacy in science. The group included: Sid Larson, CESA 2; Thersea Burzynski, CESA 10; Emily Miller, UW-Madison; Melina Lozano, MMSD; Rochelle Sandrin, MPS; and Karen Nesbit, Franklin SD. Our first products are linked below. We will post further resources as they're completed and welcome your feedback.